Rainforests – The Ultimate Green Blue Environment! During a recent business trip to visit GreenBlue South America, three representatives from GreenBlue Urban had the opportunity to stray away from the noise and chaotic bustle of Buenos Aires (which has magnificent trees by the way) and go explore the subtropical rainforest further north in that continent. Nestling on the border between Argentina and Brazil lies the superb national park of Iguazu. This is easily reached via a two-hour flight from BA. On landing, we walked down the steps from the plane and experienced a sensory overload of an incredible combination of heat, humidity, and that delicious, hot, damp, earthy compost smell. This pungent, almost tangible aroma, reminds one uncannily of childhood memories – stepping into dad’s greenhouse just after the tomato plants have been watered on a hot day! We were picked up by our happy taxi driver Raul. His English, whilst heaps better than our Spanish, wasn’t brilliant – but his smile was international. A short 15-minute drive found us at the gates of the national park. Iguazu is the ultimate Green and Blue experience – this is what trees dreams are made of! Seemingly unlimited rainfall and water along with mind boggling volumes of uncompacted, well-aerated soil combining to provide the perfect rooting and growing environment for trees and of course other plant material. Here we were able to study the optimal rooting environment and growing conditions enjoyed by these wonderful trees – with a view to deepening our understanding of the delicate interrelationship between soils, water, roots and trees, and ultimately working to fine-tune the way GreenBlue Urban can help bring enhanced rooting environments to the engineered urban landscape. 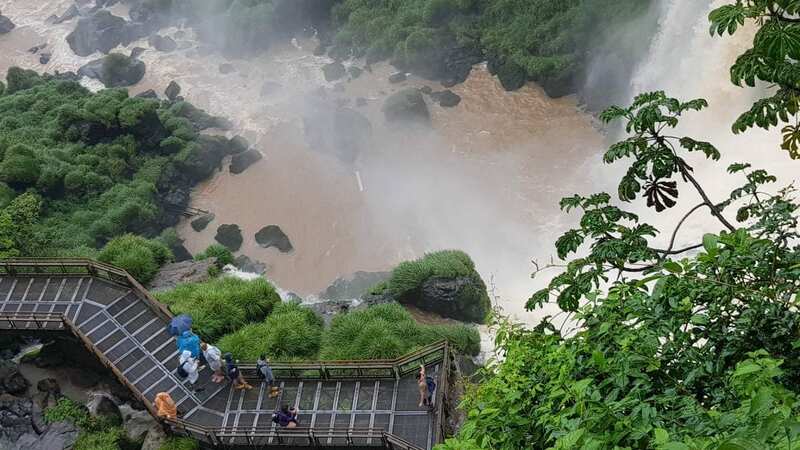 Iguazu gave us a remarkable insight and as we go forward we see how increasingly important it is to provide suitable soil with the protection it needs beneath paved areas. By applying this practical logic, we and future generations will enjoy canopy volume trees – trees which are healthy and successful. Only then will we have trees which hugely benefit the communities they exist within. Where was the ‘Blue’ at Iguazu? Simply everywhere – in the air, the soil, the humidity, the heavy rainfall, and of course the waterfalls (which by the way, you must see as well as the trees if you’re visiting)! Iguazu is a vast series of natural green and blue SUDS raingardens in action! Canopy interception, soil attenuation, ground recharge, filtration, swales and weirs, just as they should be. Iguazu justifies its reputation of being one of the great wonders of creation – visit it if you can! Discover more on the Benefits of Urban Trees! Copyright 2019 GreenBlue Urban Limited. All Rights Reserved.